After interviewing over a dozen violinists, I decided it was finally time to speak with a violist about the future of classical music. 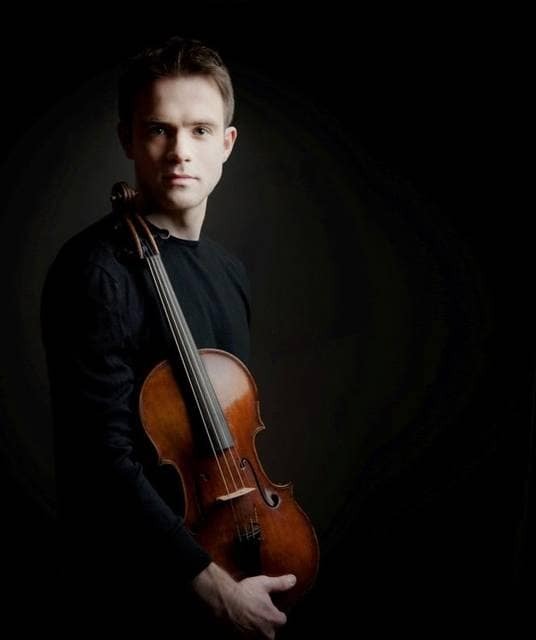 As Principal Viola for the Detroit Symphony Orchestra, Eric Nowlin maintains both an optimistic yet realistic attitude towards a career in classical music. Part 1: Discusses Eric's opinions on the Detroit Symphony Orchestra (DSO), webcasts, and multimedia inclusion in symphonic presentations. LS: In what ways is DSO different than previous orchestras you’ve performed with, regarding their approach to community outreach and educational initiatives? EN: DSO is big into getting people to play small projects where they’re explaining, why we do, what we do and why the orchestra is relevant. The other thing DSO does is community concerts in various parts of the city. Those concerts are packed and people love the fact that the orchestra comes to them. So now, the orchestra has accumulated a very loyal fan base in almost all the places it performs. These communities always want the orchestra to come back. And our repertoire is not just pops, classics or Sousa’s greatest hits. We really present programs we’d perform in the orchestra hall. Oftentimes these audiences do not resemble those who would normally attend concerts in the orchestra hall. These people are very receptive to our music. LS: What direction do you see classical music taking in the next twenty years with respect to the business and/or artistic model of the American symphony orchestra? EN: The first thing I would say is, that as the saying goes, “the Arts are in the business of losing money.” It’s a little difficult if we talk about the business model and somewhat challenging to come up with some sort of answer for the arts in which there’s sort of any hint of a profit or business motive. What I would say matters more, is asking “What is a plan for sustainability (as opposed to a business model) that make sense?" There’s no perfect system like anything else in life. In general, the American funding system, is working well. I think you’ll agree that American orchestras have the most money out of any in the world and tend to pay the most for musicians. However, American orchestras are particularly sensitive to swings in the market as it directly affects their endowment. It’s not in the interest of the public to bail them out should things go wrong. So to answer "What’s the way forward?” is a difficult task. Obviously, we are going through a sea change in the music industry as a whole. The most change has been non-orchestral. We’ve seen the biggest change is in the pop music and general entertainment sector due to the the cratering of the recording industry. Orchestras, especially during the recession, suffered as a result of that. The Detroit Symphony strike is a good example. Certainly, in many ways, the strike had negative ramifications but some extremely positive things came of that in terms of how the orchestra has restructured. It forced the DSO to reassess its priorities and forge a new way forward. Now, DSO is a leader in terms of creating groundbreaking new initiatives. LS: It seems that classical music as a genre and the symphony orchestra as an institution have both struggled to remain relevant to audiences in the wake of digital streaming and lower attention spans. How then, is an institution like the symphony orchestra relevant to a 21st century audience, conditioned for instant gratification? EN: At some point there’s going to be a bit of a backlash, and people will want more experiences that really highlight our humanity and bring us together, like live concerts. The thing that will be the best defense against the encroachment of YouTube culture will be people going to live concerts. Whether the format of a live concert changes, that’s a different discussion but the two things that will keep the American orchestra alive is 1) the continuation of performing live music and 2) music education. LS: Much of the symphonic repertoire performed today was primarily written by white European composers. However, this does not reflect the increasingly globalized and diverse society we live in today. What is your opinion towards orchestras performing classical European repertoire (Brahms, Beethoven, Mozart) as opposed to new works that reflect the musical and cultural diversity of the 21st century? EN: Let’s look at what the DSO is doing. This past season was focused on Gershwin and his influence on America and abroad. Leonard Slatkin likes to program a lot of new works and we play a lot of new music in the DSO. The classical standards aren’t neglected but there’s a real emphasis on Slatkin’s end to promote the music of our country and our time. It’s always difficult to get audiences engaged with music they’re unfamiliar with and this applies not only to classical music, but to every genre of music. Much of this has to do with presentation. What I’ve found is that speaking to the audience prior to the performance can make a big difference. Some people may regard that as pandering and I understand that from an intellectual purist’s point of view. But the practicality of explaining the music trumps whatever issues people may have with giving the audience preconceived notions. Audiences of today like having someone speak about the music, who will give them a guide in terms of what to listen for. In my opinion, that far outweighs whatever issues there may be with giving audiences a preconceived notion about what they’re about to hear. It is our job as musicians to draw people in to make them feel like we want them to be there. As long as this approach is taken, I think there’s room for success. If the school and the government is not going to do anything for music education, then we’ve got to. LS: With the widespread adoption of Smartphones and iPads, people have been able to access classical performances of world renowned performers. DSO does Live Webcasts which brings in an international audience. What case then can be made for attending a live DSO performance as opposed to a web-casted performance? EN: Well, I think it would be similar to saying “Why shouldn’t I sit at home and listen to my audio recording? Or back in the day, “Why shouldn’t I be home listening to my gramophone instead of going to concerts?” But then why do people still go to the movies? The whole purpose of a concert and what’s going to sustain orchestras in the future is that it’s a cultural event in which a group of people come together with a unity of purpose to experience something beyond which they would experience in their everyday life. It’s our job as musicians to provide them with this very rich and artistically satisfying experience. When you have a large group that’s uniformly taking part of this experience, it’s such a different feeling than being by yourself. Humans crave connection and we need to feel we can experience amazing moments in our lives with others. There’s something so much more intense about that communal experience than experiencing that individually in your living room by yourself. LS: What are some of your most memorable concert experiences that have informed your opinion of live performance? EN: I remember Vengerov’s and Christian Tetslov’s debut at Carnegie Hall. I remember with Vengerov that there was this crackling energy in the air. I can’t even describe it to you. Everybody knew this is something they would remember for the rest of their life. You can’t get that just watching a webcast. Live performance will never go away and the industry that has noticed and capitalized on this is the pop industry. You’ll see more touring and concerts than ever before because they’re making up revenues they’ve lost from recording. Recording now, whether it’s video or audio, is simply more marketing than anything else. I record CD’s with my quartet and it’s more about exposure, and playing on the radio, than it is selling a bunch of CD copies. The only place we sell CD’s are at concerts. That’s because CD’s are a keepsake. They have a physical object that reminds them of the concert. Recording in general is about exposure and marketing, and keeping a presence and being at the forefront of people’s minds. LS: Recently, orchestras have experimented with playing video game music and syncing films to live music. In your experience as an orchestral musician, how has this implementation of multi-media changed the way audiences perceive classical music and the symphony orchestra? EN: The one thing I’ve noticed orchestras seem to be doing a lot, is playing the movie scores along to a movie screening. There’s a good side to that and there’s a bad side to that. Obviously the bad side is that audiences don’t pay attention to the music so much. At the end they recognize the orchestra was there, but while it’s happening sometimes, they’re not really paying attention. Audience members who would never step into an orchestral hall, might go see “Back to the Future” concerts, and then a John Williams Tribute concert. There is that ever present question of “Can you bring in new listeners step by step, and then slowly bringing them into the power of listening to music by itself”? I will say one problem with the advent of the YouTube culture, is that attention spans are pretty short. So for a lot of people, active listening is very hard. LS: What is the best advice you can bestow to young musicians? EN: The era of graduating from high school, going into a conservatory and immediately beginning studies into how to study excerpts and audition for orchestras is outdated. What I tell my students is become the best musician you can be. Be flexible with your options. Be ready for opportunities you may have not thought about. Even unconventional opportunities outside of what you thought you were going to do in school. The most important thing is for people to learn how to play their instrument at a high degree. But being a great musician also involves learning how to read scores, playing with others in chamber music, learning how to interpret something, how to be a communicator, how to improvise, how to play a baroque violin, or how to learn extended techniques for modern music. Learning excerpts is one thing but learning excerpts certainly shouldn’t be the only thing.